In 1987, Ducati redefined the motorcycling world, releasing a four-valve (Desmo Quattro) superbike, ridden for the first World Superbike Championship by Marco Lucchenelli the following year. The incredible power of the 851cc engine (about 93hp) launched a massive era of success in the motorcycle racing circuit, and the signature Ducati design ushered in an period of commercial progress for the brand as well. In 1990, the engine bore was enlarged to 888cc's for the 851 SP2, which eventually became the Ducati 888, on which Doug Polen won the 1991 WSBK championship in 1991, which became publicly available as the Ducati 888 Sport Production Special (SPS) in 1992. Massimo Tamburini released the Ducati 916 in 1994, rocking the motorcycle world with both it's technical prowess and unparalleled physical beauty. Carl Fogarty won the Superbike World Championship in 1994, 1995 and 1998, with Troy Corser winning the competition in 1996 in between. Arguably (...though not really) the most beautiful motorcycle ever designed, with only about 104hp stock, the 916 wasn't as powerful as other Japanese inline 4 cylinder bikes, but the motorcycle utterly crushed the competition with its low-end torque, size and handling. Ducati maintained the design, but enlarged and tweaked the engine, delivering more power to to the Ducati 996, released in 1999. Carl Fogarty maintained Ducati's preeminence in the superbike world in 1999, winning yet another World Superbike Championship, which Troy Bayliss did again in 2001, the year my 996 was manufactured (above). The 998 launched the new Testastretta engine in 2002, which had even more power derived from the "narrow head," pushing about 123hp to the rear wheel. The bike was featured in The Matrix, but the last model was produced in 2004. 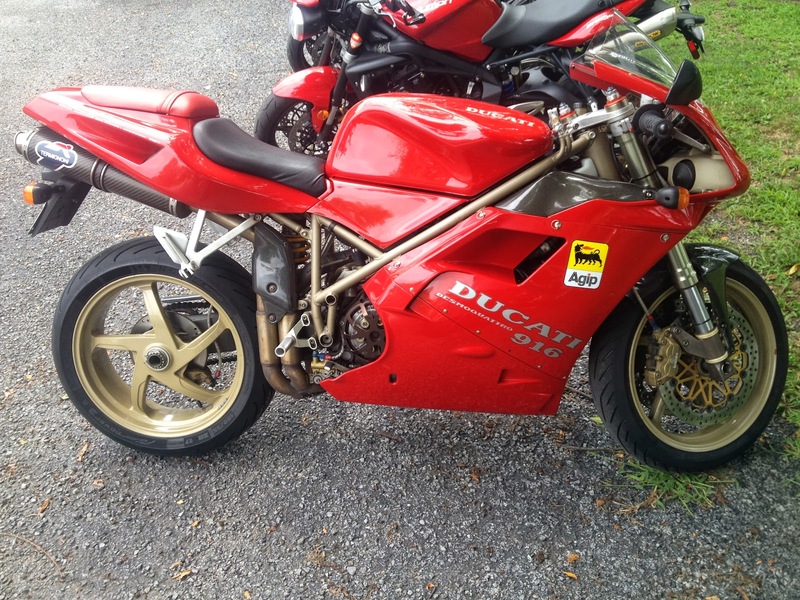 The incredibly controversial Pierre Terblanche design of the 999 was produced beginning in 2003, and continued Ducati's dominance in motorcycle racing. Ducatistis either love or hate the myopic design, but nobody argued with the power (about 138hp) and success at the racetrack, with the Ducati 999 taking the World Superbike Championship in 2003 (Neil Hodgson), 2004 (James Toseland) and 2006 (Troy Bayliss), until the bike ceased to be produced. In 2007, Ducati upped the horsepower again to about 160hp with the 1098, with new concessions offered by WSBK to the two-cylinder engine motorcycles, and Troy Bayliss won the WSBK Championship once again in 2008. With the 1098 carrying over some of the design elements of the 998, Ducati increased the engine size again in 2009, with the 1198, with the base model offering about 170hp with which Carlos Checa won the title during the 2011 Superbike World Championship season. Late in 2011 at EICMA, or the Milan Motorycle show, Ducati announced a drastic overhaul of its Superbike line, announcing the Panigale, named after the town of Borgo Panigale, the location of the Ducati Museum and where the motorcycles are manufactured, announcing the highest power-weight-ratio on the planet at the time (195hp for a 362lb bike). Unfortunately, while the Panigale is probably the prettiest bike out there, Ducati's racetrack dominance has dwindled in both World Superbike and MotoGP. Whether it's a failure of R&D or investment, commercialization of the brand, lack of concessions for V-Twin engines, Ducati Superbike fans had mixed feelings about the gigantic 1299cc Panigale release in 2015, and then a 959cc "entry-level" Panigale in 2016, hoping that the Ducati Superbike is a motorcycle for the future, not just an impressive relic from the past.